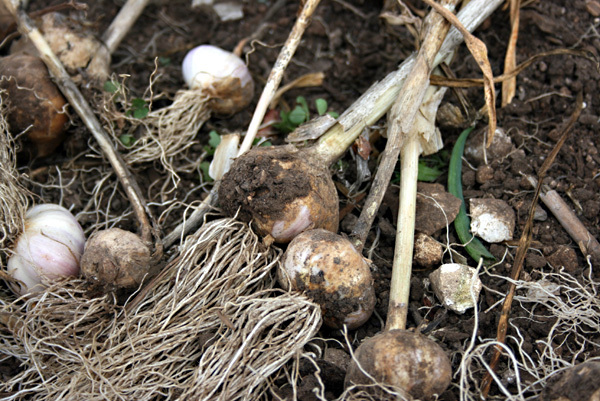 It’s a been mixed season at Blackbirds for onions and garlic. We’ve had some successes and the odd failure it has to be said. I planted onion sets back in February, about 6″ apart in rows about 12″ apart. I prefer sets, although I have had success with seed in the past. 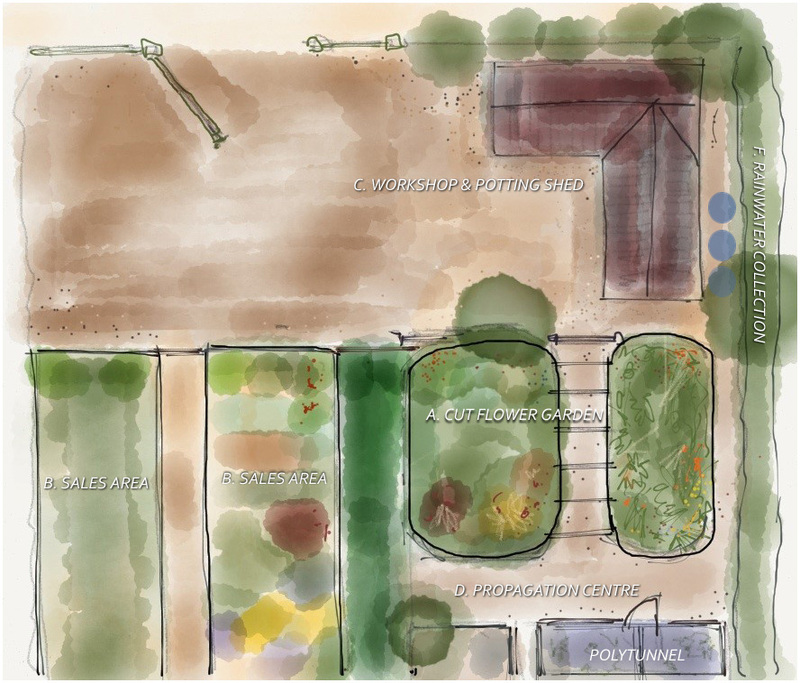 When I say ‘about’, everything I plant in the kitchen garden is based on a certain amount of guess work. I don’t believe it’s rocket science at the end of the day, just as long as you leave enough space for the plant to grow to full harvest, it should be fine. I’ve just come back from the Kitchen Garden and both my onions and garlic look ready for lifting. You can always tell as the tops fall over and start to turn brown. 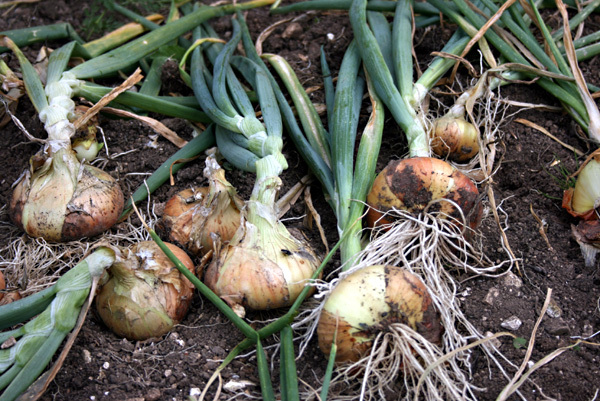 If your onions look ready for lifting I’d suggest you wait for a nice sunny day, then take a fork and lever the plants out of the ground, taking care not to damage them (or they won’t store well) and leave them sitting loose on the top of the soil, so the sunshine can bake them nice and hard. I leave mine out for about 7-10 days, after which I gather them up and lay them out on wire racks in the shed. 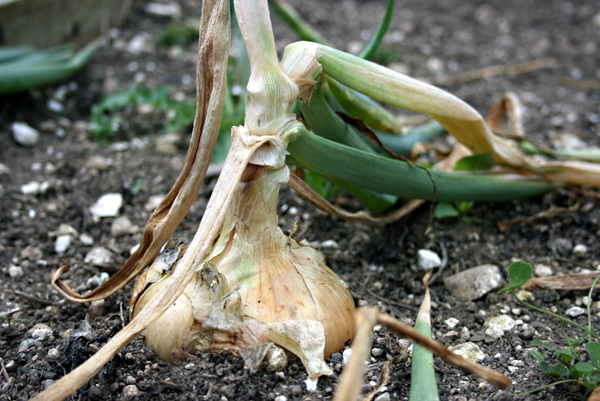 This can be a tricky period as the onions can sprout back into growth if the air is to damp, or they can also rot off, but providing you can spread them out and position them somewhere where the sun can catch them, they will dry in no time. Best to leave them on a shelf in the shed, or even outside the back door (providing its covered) just make sure they are nicely spread out, so the air can get to them. Tip: If you have some old chicken wire lying around its great for making racks to dry your onions. Main problem is the size and the general poor state of the bulbs. I did everything exactly as last year, and I also grew them in a different patch of the garden as we garden with a rotational system at Blackbirds. I think it cold be a couple things as I was a bit late planting them out and also I didn’t water quite as often as I should. Anyway, I’m going to dry them on my low tech chicken wire racks in the shed, and see how I get on. It’s unlikely I’ll be making garlic strings this year though. Last year I worked out how to make a garlic string, so this year I thought I’d have a go at making a string of onions. I’ll post the details in a couple of weeks when the onions have had a chance to dry out. Looking outside today the weather has broken and it’s raining, which is great for the garden. I guess every cloud has a silver lining, as they say.